The MEDC world tour is over and my contribution was participating in panels and presenting at two locations: Las Vegas and Berlin. In both the US and the European events I delivered the sharing assets and the mobile UI tips sessions. You can find the powerpoint slides from both my breakouts in this ZIP file (tip: some of the slides have URLs for more info at the bottom). A few people asked me this week for my material for the Windows Mobile session I did at DevDays last week. You can get the demos from this post. What you'll also find from there are links to screencasts I have done and other relevant blog posts. Note that even though those demos are for WM5 projects running in VS2005, the code is identical to what I showed in VS2008 Beta 1 targeting WM6 – no code change whatsoever. Download the slides here (pptx inside another ZIP). If you are on a legacy version of powerpoint, see this post. Last November I made a TOC post that linked to all my work on Vista-only features for Managed Developers. I have updated that blog post today so I strongly suggest you revisit it if the topic interests you and you want content, videos and slides. By following and reading those links you can recreate every single one of my demos – trust me, that is the best way to learn this stuff! You should also note that any demo I show in presentations is a DEMO; it is not real production-ready code by any stretch of imagination. Also many of my demos won't make any sense to someone that has not seen me present them (e.g. at UK MSDN events, Tech Ed, UK Vista launch, DevDays...) and some of them are incomplete since I do the coding on the fly while others will not work if you don't install their dependencies as described in my sessions. My demo projects target .NET Framework 2.0 from C# and the project/solution format is for Visual Studio 2008. 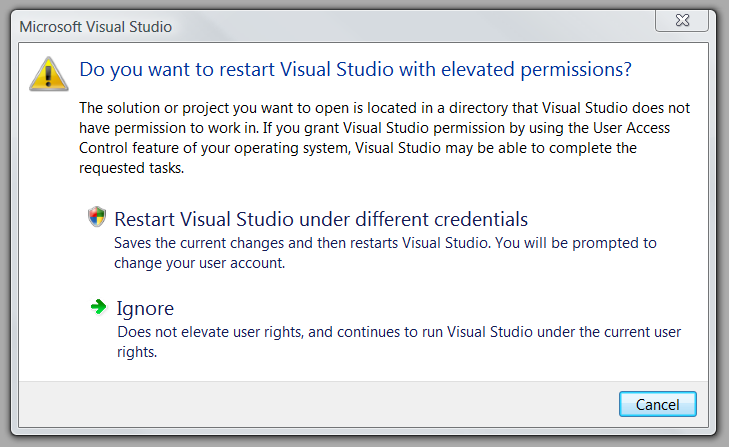 You could create VS2005 projects and add the code files from my projects if you don't have VS2008 Beta 1. So, with those caveats in place and by popular demand, you can now download my demo code here. Enjoy! 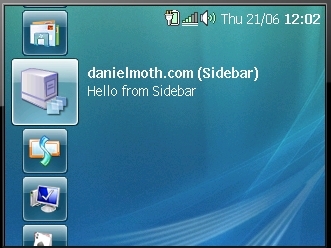 In the past I have introduced Sidebar gadgets and have made a quite few blog posts on SideShow. What I've not done here is talk about the integration between these two. In this blog entry I'll assume you are familiar with both of them independently. 1. Add an icon for SideShow to your Sidebar gadget manifest. 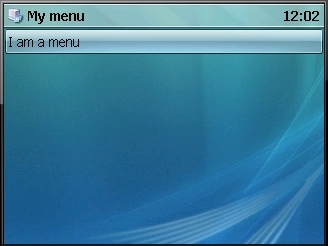 In your gadget.xml file you already have an icon element under an icons element which is under the gadget element. You need to add another element named ico that points to your SideShow icon i.e. 4. If you want to send SCF pages, use the same method as above, this time changing the id (first argument) as appropriate and making the 2nd argument hold the XML, e.g. Clearly, if you select the menu item then you'll get a "Page not found" message because we haven't send any other page with an id=2. I leave that as an exercise to you. Of course, it would be great if whatever you render on your Sidebar gadget automatically got sent to the SideShow device but as you see above, that is not the case. However, the crucial part of building gadgets in general is getting the content that you want to show: you only need fetch that once and then you just need to package it twice (html for Sidebar and SCF for SideShow). Note that if you want to send images that you reference by id in your SCF pages, then you must use the addImage API. When you visit the APIs, ignore their advice to check for the enabled method because it apparently always returns true. Also note that when you want to update the same content id, it is best that you call the remove method first and the send down the new content corresponding to the id. You should also not bother with notifications or events for combined gadgets, since the applicationEvent is non-functioning. "Overall, I like this feature *a lot* (will post some concrete examples of why in the future)." "While using .NET Compact Framework classes, the occasion often arises that a particular class has members missing compared to the full Framework. Typically, developers have to write the missing functionality themselves and then decide whether to use inheritance if possible to add the missing members or add them to a utility helper class." Please visit the article to see a good example of how extension methods can help with the above scenario. When we faced this issue in the SDF from OpenNETCF, we took one decision in some cases (utility classes) and the other decision (inheritance) in other cases. Unfortunately, utility classes suffer from the inherent non-discoverability for client code and inheritance is not always possible due to sealed classes. So many times we opted for a 3rd approach (that I was never entirely comfortable with): Introducing a replacement class e.g. TextBox2. Now, there are still scenarios where that approach is the only viable technique, but for some cases using the Extension methods as I describe in the article is a better alternative. ...and then the codefile that uses the Timer can be the same on both platforms, e.g. In my July MSDN magazine article, I have collected in a single place my tips for writing cross-platform managed code, in this case meaning code that targets both the Windows desktop and Windows Mobile. Even though the article was written with the .NET Compact Framework and the full .NET Framework in mind, most of the techniques apply in other scenarios as well. Consider how many frameworks/CLRs we have today: .NET Compact Framework, full .NET Framework (aka desktop framework), .NET Micro Framework, Silverlight CLR, MONO (framework for non-Windows platform) etc. To that list you should add scenarios where you wish to target two different versions of the same framework type e.g. both v1.0 and v2.0 of the NETCF/Full Fx. Even though it looks the same, the framework/CLR between versions is effectively a different framework so again some of the principles in the article apply. Read the article here. At some point in 2006 I started writing a book and at some point in April 2007 we completed the project. I say "we", because I had two excellent co-authors, both long standing Device Application MVPs: Peter Foot and Andy Wigley. I would have liked to be able to say that I also am a .NET Compact Framework MVP, but unfortunately I lost that title when joining Microsoft last year as per the rules. 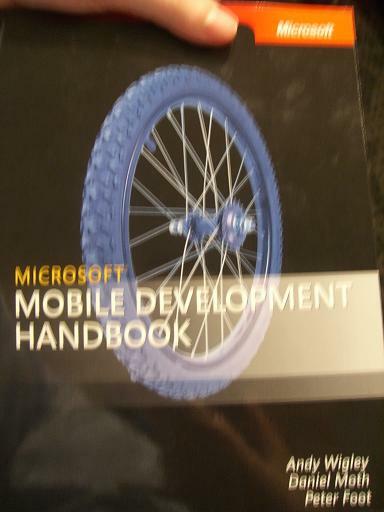 If you are already targeting Windows Mobile devices you will know that all existing books talk about version 1.0 of the .NET Compact Framework and Visual Studio.NET 2003. Since those times there have been three service packs for v1.0, version 2.0 with two service packs and, of course, Visual Studio 2005. Furthermore, v3.5 is in Beta 1 right now as is Visual Studio "Orcas". Our book covers what is new in the .NET Compact Framework and Visual Studio 2005 compared to their predecessors. It also covers throughout the chapters, but also in a dedicated chapter, version 3.5 of the NETCF and VS "Orcas" for Devices. There are millions of proficient .NET desktop developers that would like to know how to write code for their mobile device or generally want to find out how to transfer their skills or business logic to the mobile platform. The book's tone is certainly aimed directly to those developers by continually contrasting and comparing with desktop development as applicable, highlighting what is different or missing when doing device development. This book is all about managed code, but we never introduce any basic .NET concepts from scratch. We expect readers to know about those either through experience with previous versions of NETCF or through .NET desktop development. 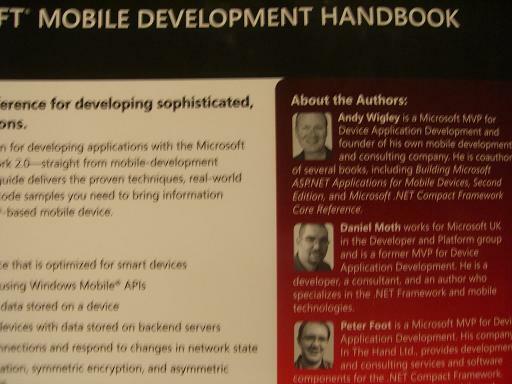 So if you are a native device developer, you should pick up another book to learn the basics of .NET. We also have made no assumptions of knowledge about the Windows CE and Windows Mobile platform. The reason is so desktop developers can get an introduction to the whole stack/environment and not just the dev platform and tools. So, as a native device developer, you will encounter concepts explained that you probably already are intimately familiar with. Whether you are looking for a book to read cover-to-cover or for a reference that you go back to, this book will fulfil your needs. It isn't just a book on the raw technology, but more importantly it captures lessons from developers that have practised mobile and embedded development in the real world. While prepping for an event in Amsterdam next week, I am revisiting all my content from last year to do with Vista for managed developers. A very small part of the presentation is showing the WinForms controls and what additional things you can do with them in Vista such as the TextBox cue banner, commandlink button, treeviewvista, adding shield to clickable controls etc. For a more complete reusable wrapper of the ProgressBar (inc. some other features that I have not covered) check out the code from the VistaControls project on codeplex. 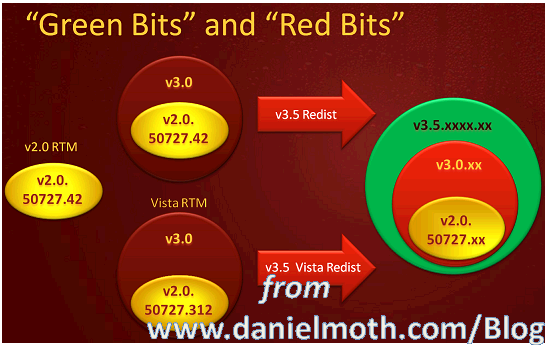 ...with updates mainly for WM6 devices, available here (32-bit) or for 64-bit here. It is as if Roy has been eavesdropping to similar discussions we are having here in the UK. 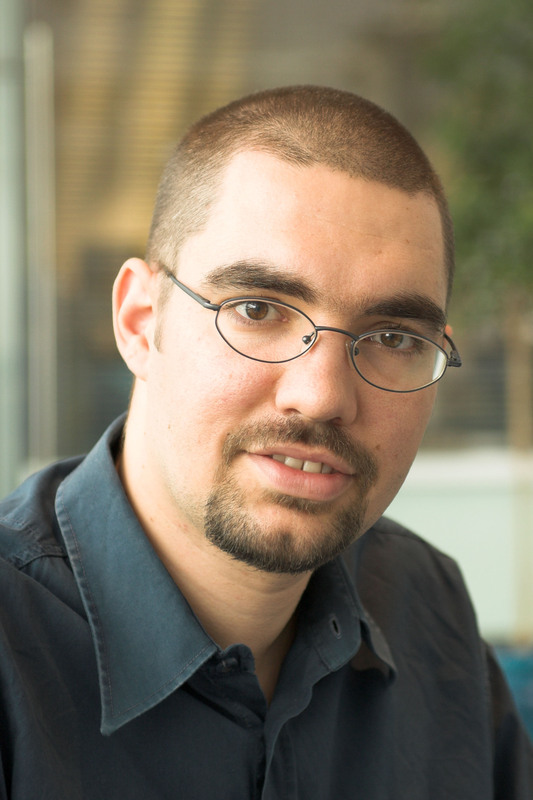 Check out his list of tips for better user group meetings. As if I didn't have enough things to play with and events to prepare for, my incoming list shows me an Acropolis CTP. Download it here. - There has been discussion on the web about comments Martin made about AlphaGeeks. It is too easy for people to jump on the "doom train" (fact: being negative is so much easier than being positive), which is why I found Rocky's take most interesting: Busy, busy, busy. - Bill and Steve talk. If you don't have time for the full interview, watch this 8' of highlights video. - I am glad that other companies are finally seeing my point of view: pure web apps don't cut it; we need offline support and fast UI response. Read Tim's report from Google Developer Day.